Last month, we broke news that Microsoft had cancelled the Phantom Dust reboot that was in the works at an independent studio called Darkside Games. As a result of this cancellation, Darkside shut down, laying off around 50 staff. The news has raised questions about the fate of Phantom Dust, a beloved cult classic that was originally released as an action-strategy-card game for the original Xbox back in 2004. Microsoft says they're still working on their planned reboot for Xbox One, which they announced last year at E3, to much excitement. But it remains unclear whether publisher is using what's already been created by Darkside or totally starting from scratch—and they won't give any details—which has led fans and even the ex-developers at Darkside to wonder just what the hell is going on. We have at least a little more concrete information to offer. Today, we can reveal what Darkside had developed before they shut down, thanks to leaked video footage sent to me by a source who worked on the game. This video is from a "near-final" slice of Phantom Dust that the developers showed to Microsoft just before their game was officially cancelled, according to that source. "Each player would have an arsenal deck of cards (skills) they could mix and match to bring into a battle, but their cards/skills were randomly selected from the deck once in the battle," said a person who worked on the game, speaking anonymously because they are not authorized to speak publicly about this project. 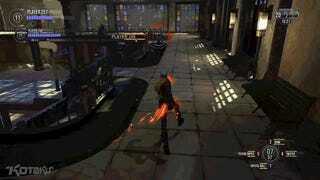 In the match shown above, the player starts with four skills: Bomb, Bullet of Fire, Levitate, and Heat. He swaps Heat for another skill, Psycho Knife, before the match begins. These names might sound familiar if you've ever played the original Phantom Dust—some are similar and some are taken straight from the original game. "You'd have a starting hand (shown in the bottom right) and if you didn't like that hand, you could do a re-roll at the start of the match," the source told me. "The orbs you pick up represent those cards/skills." After setting his skills, the player in the video runs around pelting his opponent with fireballs. Constant mobility appears to be a big theme here, as is environmental destruction—at one point, around 1:25 in the video, the player knocks down a pillar, and does the same a few seconds later. He plays around with other skills, too, including abilities called Crystal Wall and Twister. There are particle effects everywhere—fireballs, barriers, gusts of wind. It's not exactly mind-blowing, but it's pretty. "One thing I'm bummed about is not having footage of the big level destruction even where the tree grows huge roots, knocking down most of the 2nd and 3rd floor platforms," said the source who sent over this video. "But you still get a sense of the destruction with some walkways going down from stray shots." This footage is instantly recognizable if you've ever played or seen the original Phantom Dust, which is by design, according to people who worked on the game. Their edict was to reboot it, not re-imagine it. "Originally the edict was to go 70% original game, 30% new," said the source. "Over time that turned into 'remake Phantom Dust,' so that was our goal for the last half of development. We were going to update and streamline a very dated game (especially their menu system and horribly paced single player), but otherwise it was going to be a reboot/remake. I'd say we were probably trending towards an 85% remake, 15% new." Looking at the demo footage might make you wonder why Microsoft cancelled Darkside's Phantom Dust. It certainly looks good, and although we have no way of knowing whether or not it was actually fun to play, it's easy to imagine a deep, interesting multiplayer game with the type of mechanics and aesthetics we can see in this footage. "I believe that the vertical slice we delivered was as good as anyone could have reasonably expected," said a person who worked on the game. "It was very nearly E3 demo good, way beyond what a vertical slice should be. But apparently not good enough for them. And to hear them quickly say they're finishing development elsewhere is certainly a slap."